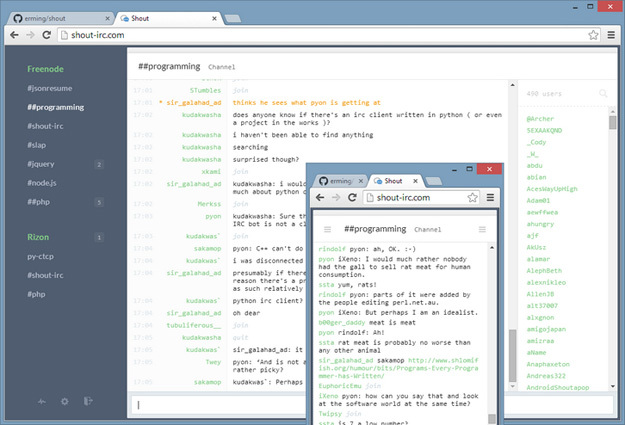 Shout is a web IRC client that you host on your own server. It stays auto-connected with no configuration. It offers a great desktop (web-based) UI, including embedded images, videos, tweets, pastebins, and more. And it offers fantastic mobile apps for both iOS and Android, for both phone and tablet form factors. Best of all, it’s free for download and released under MIT license. 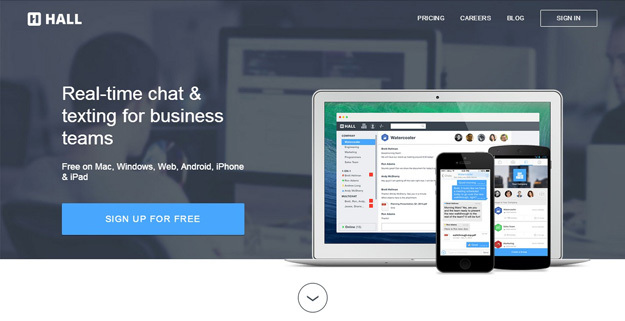 Let’s Chat is a self-hosted chat app for small teams. It supports Persistent messages, Multiple rooms, New message alerts, Mentions (hey @you), Image embeds, Code pasting, File uploads, SSL/TLS and more. It is licensed under MIT License. 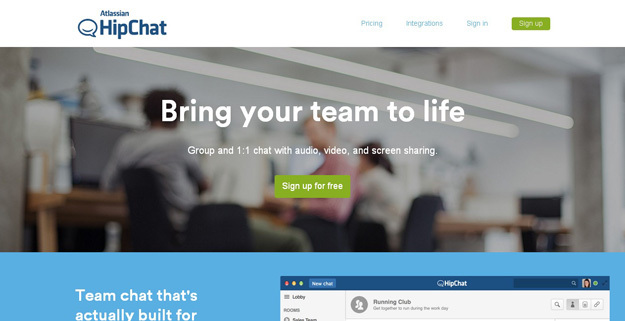 HipChat is fast growing application for team collaboration which offers number of features with chat interface, it lets you share files through any of the HipChat applicatioins for web, mobile or desktop computers. The group chat is also helpful because users can embed photos or other types of media which need to be shared. 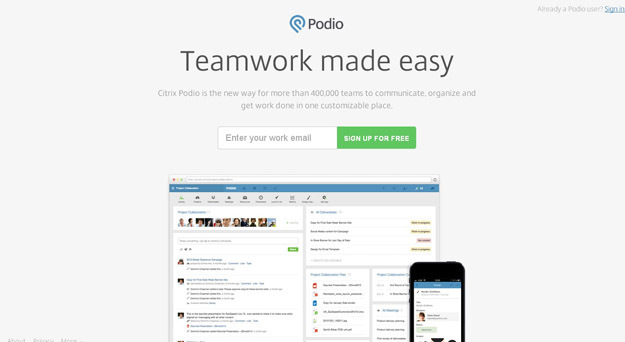 You can signup for a free 30 days trial, or if you have a big team you can add 2$/user for collaboration. 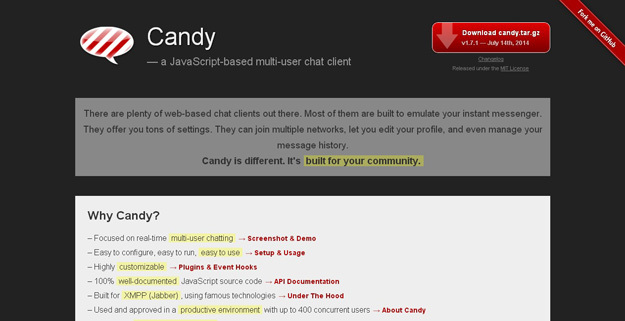 Candy focused on real-time multi-user chatting. It is easy to configure, easy to run, easy to use. It is highly customizable and 100% well-documented. And it is used and approved in a productive environment with up to 400 concurrent users. It works with all major web browsers including IE7. 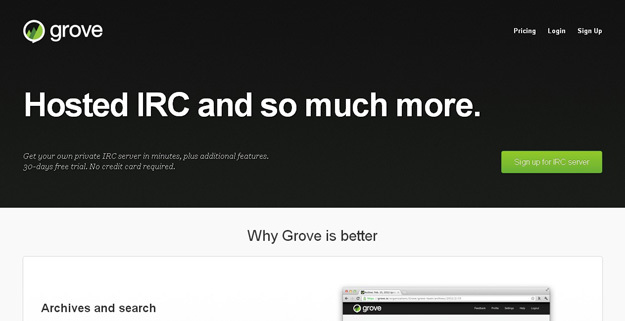 If you’re a fan of IRC (Internet Relay Chat), Grove is the right tool for you. You can use your favorite desktop or mobile client to connect with your company’s server. In addition to the usual IRC features, Grove also has built-in extras like archives and access control. 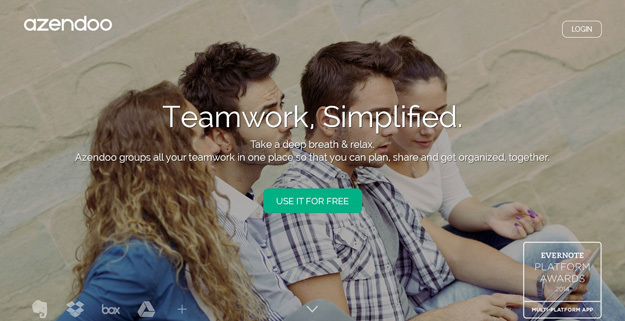 Flowdock is a team collaboration app for desktop, mobile & web. 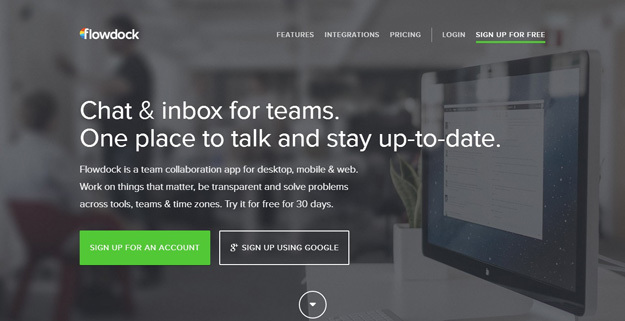 Work on things that matter, be transparent and solve problems across tools, teams & time zones. 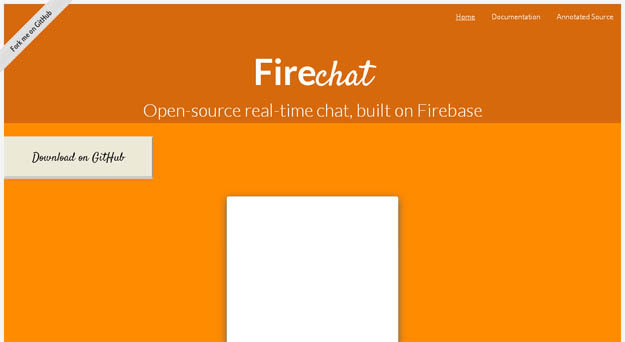 Flowdock lives on the web, and runs beautifully with any modern desktop browser. 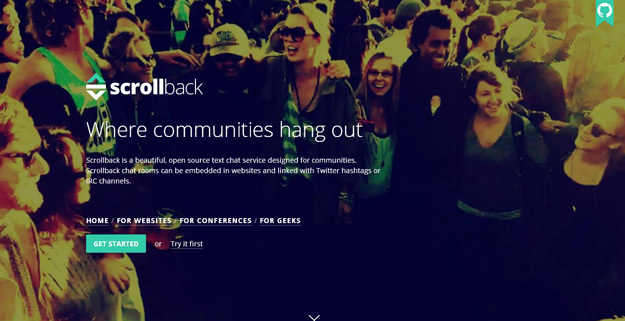 But if you prefer to go native, Flowdock apps are available for iPhone, iPad, Android and OS X.
Scrollback is an open source web application for adding a modern chat for websites. It is built with Nodejs and can be either used with the free hosted version or by downloading and self-hosting it. 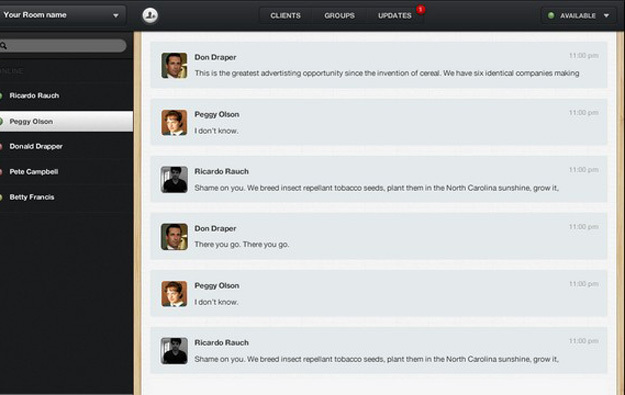 The app creates a single room chat interface where the community can communicate with each other. 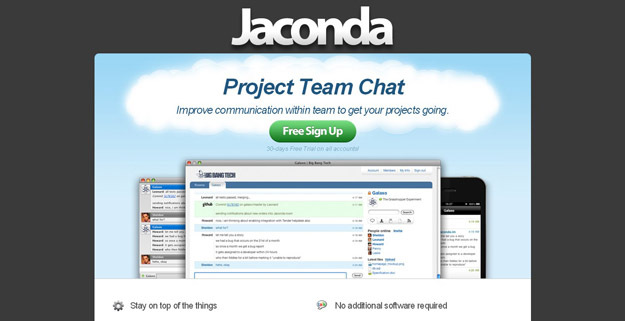 If you are looking for a classic team chat solution then Jaconda must be a fantastic choice. It is free for 30 days and it does have some costs associated with a paid account. However their services include a number of chatrooms with support for very large teams, think medium-to-large companies in size. 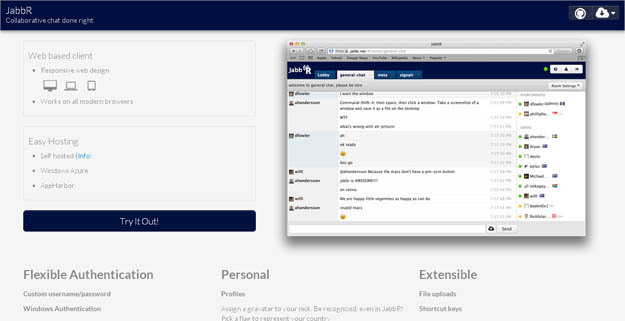 JabbR is one of those treasures, it is an open source ASP.NET app for real-time chats. The app uses SignalR library for the communication and allows users to register/sign-in with their e-mails or via social auth (Facebook, Google, etc.) Users can define an avatar for themselves and communicate in a chat room (multiple chat room support with a tabbed interface) or privately. 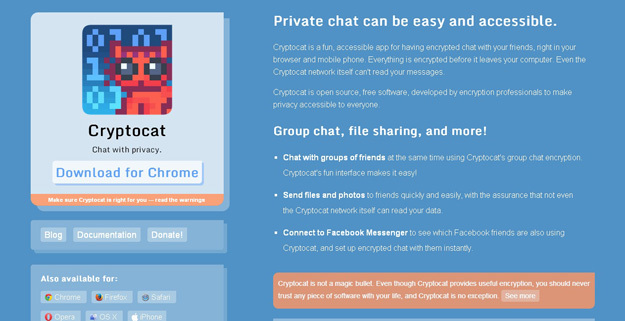 Cryptocat is a fun, accessible app for having encrypted chat with your friends, right in your browser and mobile phone. Everything is encrypted before it leaves your computer. Even the Cryptocat network itself can’t read your messages. Cryptocat is open source, free software, developed by encryption professionals to make privacy accessible to everyone. It is a project management system which allows for a full company-wide group managing individual projects. 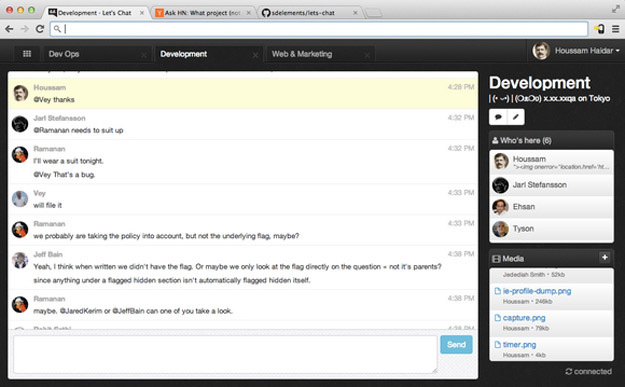 The chat system is very similar to Facebook where you can get notifications and private messages. You can also leave comments on certain tasks based on projects in the group. Hall is free to use for a personal account when just getting started. With Hall you can easily send messages one-on-one or in groups with users’ in- or out-of-network, no need for a work email address. Hall uses state of the art technology and industry best practices for data encryption during transit to and from the Hall cloud, as well as while stored within Hall. It is a full backend management suite for projects that need to handle multiple users. Their signup is free under 5 team members and you can try out a large number of their applications using this free account.